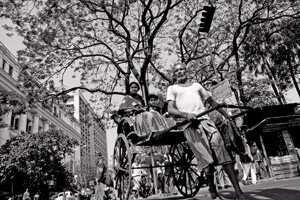 Relic: Kolkata still has hand-pulled rickshaws not found anywhere in the world. Photo by Indranil Bhoumik/Mint. Which Indian city has the best infrastructure, the most attractive culture? In a nation where Nasscom says 90% of all graduates are unemployable, which city produces many times more competent people than it can hire? Which city is our greatest net exporter of talent? Which city will win in 20 years? This is ridiculous, because Kolkata lags Delhi, Mumbai and Chennai and even Bangalore, Hyderabad and Pune in attracting investment. It has no software economy and no financial sector. What industry they inherited, Bengalis have packed off efficiently. Then there is the matter of the anarchy. Even by India’s low standard, Kolkata is a monumental mess. Little governance is visible on its roads, which the state has surrendered to the population and shows no desire of retaking. But Kolkata has assets, chief among them its people. In a world where cultures must integrate, Bengalis have built one of our most attractive and open cultures. More about this later. If you were to close your eyes and imagine the city without its grubby occupants, Kolkata actually has the finest infrastructure of any Indian city. Options for getting around the city include a Metro (not found in Mumbai), local trains (not found in Delhi), taxis (not found in Bangalore), trams (not found anywhere in India) and hand-pulled rickshaws (not found anywhere in the world). It is even possible, though it isn’t advisable, to walk one’s way around the city because it has footpaths, something supposedly urban centres like Gurgaon and Bangalore don’t have. The problem is only that all this great infrastructure is poorly managed. And actually it is very easily remedied. New tram cars running on these same tracks can transform inner city commuting. It is the middle class (not the poor) that uses the rickshaw in the old city lanes of north Kolkata. A boost in their incomes will mean bigger fares for the destitute Biharis who pull them around. Kolkata’s taxis run on metered fare, unlike in most of India, and need only to be more modern. The systems are in place. A little governance is required to get the economy moving. A man or small group of people charged with making the city attractive for investment can transform Kolkata in five years. I’m tempted to say it should be one of the Bengali-speaking Gujaratis or Marwaris who support Trinamool. They will know what to do and instinctively connect with those who have capital. Labour unions are not relevant in the IT industry where retaining trained talent is the problem and not job security. A little assurance from Kolkata that it will not be aggressive on such issues for white collar workers will get businessmen excited. Let us turn to culture, Bengal’s priceless asset. He is useless at managing his own economy, true, but the Bengali represents the moral end of our politics. The Communists and Mamata Banerjee can be accused of many things. Being corrupt and being communal are not among them. Perhaps they don’t really know how to make money in office, but their open-mindedness is deliberate and comes from within. The city of Kolkata is Britain’s gift to Bengal, a one-city state. Bengalis have responded by producing an urban culture that is sophisticated and modern. This gives them an attractive duality. Middle-class Bengalis are comfortable and, importantly, urbane in both English and Bengali. They can express modern ideas in their language, which is supple and can accommodate words from other languages easily (“bourgeois"). This separates them from much of India. High culture comes from Kolkata’s bhadra, who is Kayastha/Brahmin/ Baidyi (Vaidya). Along with southern Maharashtra and northern Karnataka, Kolkata is the place that produces classical musicians at will. Despite having a majority Muslim population, Bengal’s nationalism has coalesced around Bengali language, not religion. One reason Bangladesh isn’t Pakistan is that it is insufficiently Islamized. But why? Because the gentle leavening of Rabindric culture has resisted the harsh call of an Arab social order. Bengal is animist, and its riverine geography has retained the river-based culture of our ancients. This culture the Bong carries with him where he goes. Bengalis are among our most ubiquitous professionals. They dominate the media and are represented heavily in services and academia, and in higher management. They are all-rounders. They bring a sense of quality and aesthetic that is uncommon. Let one example suffice. The best designed newspaper in India is Anandabazar Patrika. Its puja-special magazine is a thing of beauty and not to be compared with what other Indian newspapers produce. The outsider who can look past the grime and the soot will find much that is rewarding in Kolkata. It is our only city to have a Chinatown. It is our football capital, with a proper and passionate football following. This integrates it with Europe and in time, when there is money in Bengali sport, this will be one of the city’s big assets. There is history on Kolkata’s roads, and many people will come to see it if they are shown it—the homes of Tagore and Vivekananda, Victoria Memorial and the lovely British-built areas around Park Street. Also the great spiritual centres that were founded around the city and radiated their message of soft Hinduism across India. Kolkata is altogether more relaxed in the mingling of the sexes. This is something I’ve noticed in all cultures where honour isn’t at a premium, and it is the same in Gujarat. Single women are comfortable in the company of men. Kolkata has excellent places to eat and drink. Meat is served, and alcohol is freely available. Bengalis don’t have the fake morality of some of our other cultures. Gujarat covers itself with hypocrisy. An Ahmedabad daily I worked at reported a few years ago that the majority of licensed drinkers in the city also insisted on prohibition. Why? “That’s our culture," they said. On leaving the Prime Minister’s Office (PMO) and becoming the chief minister of Maharashtra, Prithviraj Chavan’s big initiative has been to raise the drinking age in Mumbai to 25. He spent years learning at Manmohan Singh’s knee, but the peasant’s instinct isn’t easily exorcised. Another Maratha, R.R. Patil, abolished the city’s beautiful dance bars. Between them, the pious Marathas have done satyanash of that city. Piety is a personal value and not to be inflicted on another, but this is difficult for some cultures to internalize. It isn’t that Kolkata isn’t devout, and there is no celebration like Durga Puja anywhere in the world. This much religious fervour would otherwise always inject a harder edge into the air. Like it does during Ahmedabad’s annual rath yatra, whose organizers insist that its floats parade through the Muslim ghettos of Shahpur, Kalupur and Dariyapur. Floats on which akhara braves, bare-chested, display their valour. What does Sri Vishnu have to do with bodybuilding? Kolkata’s puja is festive, and inclusive. Not threatening, not menacing. From either end of the subcontinent, two disparate states observe India pass them by. Gujarat and Poschim Bongo (should we now call them Bongolis?) are two states that don’t fall neatly into our north-south division. Both states have missed making money in the new economy. Gujarat has missed out despite having outstanding infrastructure— power, roads—and access to capital. All that fledgling information technology firms need. It has governance but does not have the fundamental ingredient: human capital. Oriented towards trade, its urban class is uninterested in, for the most part contemptuous about, employment. English isn’t spoken in Gujarat, even by the elite, for Gujarati delivers the most important function of modern language—communicating complex economic thought. This will not change for a very long time. Kolkata has a different problem: It lacks governance. But by way of human capital it is India’s wealthiest city. Twenty years ago, this meant little and Kolkata’s brightest minds left the city. Today it is gold. I always enjoy visiting Kolkata, even if by the third day of looking at the happy poverty and the chaos the mind turns to thoughts of escape. All Indian cities have problems. Few also contain solutions. It is entirely possible, and I think most likely, that Bengalis will be able to sort out theirs, which are quite minor. Kolkata will then be one of the world’s great cities again. Such a beautiful and cultured people deserve it.